For international long haul flights, there’s a total of five ticket types – three for economy and two for premium. Since I travelled in economy, we won’t consider the premium tickets. Instead, we’ll look at getting the most bang for buck at a low price – that’s the point of low-cost airlines after all! First up, if you may ever need to change the date or time of your flight, for example if your travel plans change or if you’re flying for business, then the most expensive Flex ticket is the only way to go. With other ticket types, there’s a whopping £90 charge each way to change the name on your ticket, and if you need to rebook onto a different flight, its £90 plus the price difference of the new ticket. If like me, you have your travel dates set in stone, then you can ignore the flex option and save some cash. That limits your choice to LowFare and LowFare+, where the difference is whether or not you want to take a 20kg checked bag, reserve your seat and be served food onboard. The difference in price is just £50 each way, which is £25 cheaper than sticking with LowFare and buying everything a la carte. Checking a bag separately can vary in cost due to a complex pricing matrix, so if baggage allowance is important to you, LowFare+ really is the best option. From my point of view, I could have travelled light with a LowFare ticket, however I didn’t like the sound of an 8 hour flight with just a handful of sandwiches and snacks picked up from duty free, and preferred to have chosen my seat – more on this below! All long haul flights are flown in brand new Boeing 787 Dreamliner aircraft, which are some of the quietest and most fuel efficient aircraft available at the moment – the latter being a key factor behind the low fares. The economy cabin takes up approximately three quarters of the aircraft in rows of 3-3-3 across. One of the best features are the large windows, which Norwegian claim are 65% larger than other aircraft. Not only do you get a better view outside, even you sit in the aisle as I did, but their special feature is a five level dimming system instead of a window blind. This means there’s no compromise when you want to let a small amount of light in – with an old school window blind, bright light can still come in if it’s not all the way down, which can be annoying it ends up shining on you. Instead, the dimmer means light can be reduced in stages. All in all, a much better experience! So if you’ve got a LowFare+ ticket and get to book your seat, which should you pick? Head on over to SeatGuru and you can get a map of the aircraft to find your ideal seat. The site even picks out bad seats, for example rows with missing windows, or those near toilets, which can be annoying. I picked seat 9C for both my outbound and return flights. This looked good on paper as it’s the closest row to the exit for a swift getaway upon landing. However, there were some downsides. First is that other customers would come up and use the space around the door to stretch their legs, and being a light sleeper, this can be a bit annoying. The other is that it’s right next to the galley, which is a hive of activity for the crew, so not ideal if you want to relax. 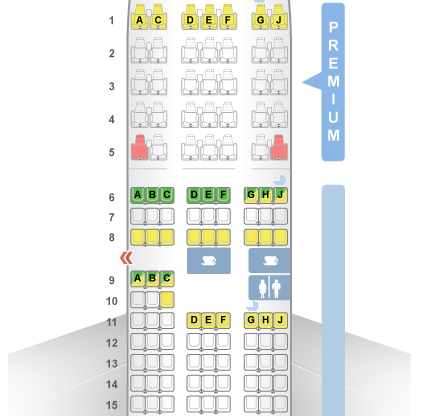 9A would have been a better option, though looking at SeatGuru, seats 6A to F look to be the best for economy passengers on the plane. The only other thing to consider is that bulkhead rows such as row 6 and 9 have their infotainment screen tucked into the armrests, making the seat slightly narrower. Standard seats have a seat pitch (the distance between the seats) of around 31-32 inches, which is actually pretty good as it’s the same as British Airways in economy, and larger than short haul airlines like EasyJet at 29 inches and Ryanair at 30 inches. Plus, being new aircraft, the seat backs are thin but comfortable, allowing extra leg room. They even recline slightly, which I wasn’t expecting! Norwegian say that the infotainment screens at every seat contain over 150 hours of video content, which may sound like a lot, but like me, you’re likely to find there’s not too much of interest considering all that content is spread over several different genres. If you’re interested though, remember to bring a pair of headphones with a 3.5mm cable, as you have to buy headsets on board if you don’t have your own. The benefit however, is you get to use your own headphones, which for most people, would be better than the poor quality headsets that many airlines force you to use thanks to their proprietary plugs. But if you want more entertainment, your best bet is to bring along your own, whether it’s a good old fashioned magazine or an iPad. Each seat also has a USB charger, though this is only enough to power a smartphone – not a tablet. however, in economy class there’s only two full size power sockets for every three seats, so it’s worth bringing a back up battery if you have one if it’s critical to get your device juiced up. If you opt for a LowFare+ ticket, you can choose your meal before you fly. You’ll get one hot main meal and a smaller cold meal later in the flight. I chose beef with potatoes and vegetables and a Heineken for my main followed by a chicken sandwich for the second meal, which also came with a small brownie and orange juice. The food was better than I expected from a low cost carrier, though not as good as the food on my last long haul flight on Emirates. If you’re a big eater like me, it would be a good idea to bring some extra snacks along too, as like most airplane food, the portions are rather small – particularly the sandwich in the second serving. It is possible to order any extra food on top of this via your infotainment screen – you just choose what you want, pay on credit card using the slot on the side of the screen, and it will be brought to you. While you can buy bottled water, you can get a free cup of water by asking a member of staff at the galley, though it’s still a good idea to bring a large bottle from duty free to keep you going for the whole flight. One of the questions you’ll have when considering Norwegian is whether or not it’s worth paying a bit more for a more premium airline. That all depends on who else is flying that route. For my trip from London to Austin, there were only two airlines – British Airways, flying from London Heathrow, or Norwegian, flying from London Gatwick. The key difference here is Heathrow is essentially the UK’s flagship airport, the largest and best connected with London. Gatwick meanwhile is the UK’s second busiest airport, and takes a bit longer to get to from the city. The result is that Heathrow is generally used for higher end, business passengers, while Gatwick is a so called ‘bucket-and-spade’ airport mainly for families off on holiday. Despite this difference, the cost of the flights weren’t hugely different. Norwegian advertised the return fare as £350, but that became £450 to get a LowFare+ ticket each way. The British Airways flight was £500. But the biggest difference for me was getting to the airport. Living outside of London on the opposite side to Gatwick, it was easier to drive, rather than take the train through the city centre with a heavy suitcase. Parking at Gatwick for a week was around half the cost of Heathrow, so that became a no brainer for me. But had it worked out easier and cheaper to get to Heathrow instead, that’s what I would have done. It’s aways a good idea to take the whole cost of the journey from your home to the airport plus the flight into account before booking, if you’re price conscious. 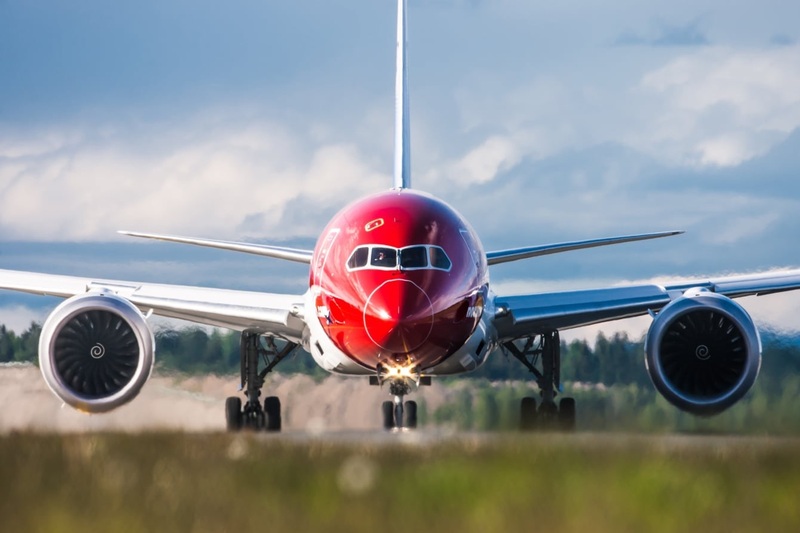 All in all, I was pleasantly surprised by the experience on Norwegian – it wasn’t massively far off from other, more expensive airlines, when flying on a LowFare+ ticket. The only real thing that could have been better would be the selection of video content on offer, however considering that WOW Air don’t even have in flight entertainment, it doesn’t look so bad. Remember to check the price of getting to the airport as well as the flight itself to work out the best deal!